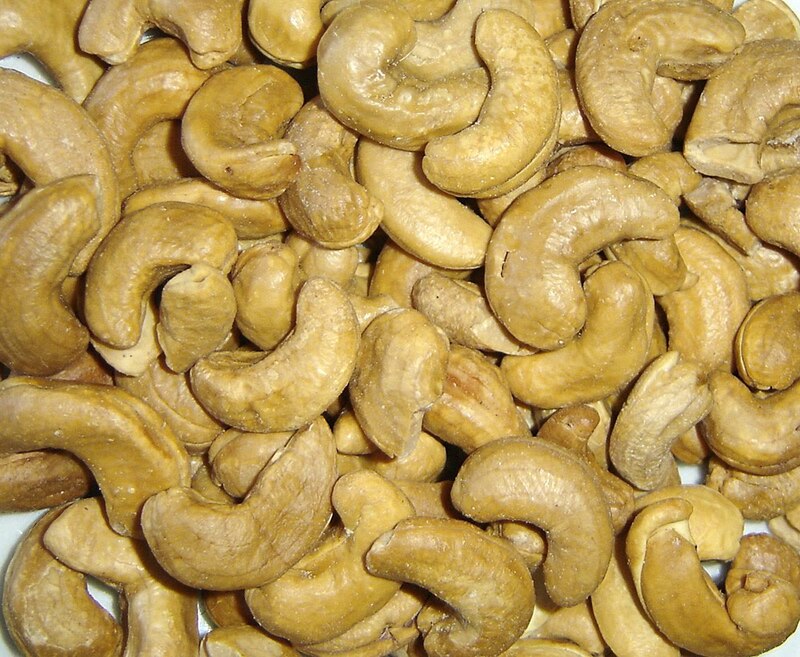 HomeREMEDYCashew Nuts: Health Benefits & Nutritional Facts. Cashew nut is packed with energy, antioxidants, minerals and vitamins that are essential for robust health. Cashew, or “caju” in Portuguese, is one of the popular ingredients in sweet as well savory dishes worldwide. Botanically, cashew is an average size tropical evergreen tree belonging in the Anacardiaceae family, in the genus: Anacardium. Scientific name: Anacardium occidentale. The cashew tree is native to Brazil’s Amazon rain forest. It spread all over the world by Portuguese explorers and today, it is cultivated commercially in Brazil, Vietnam, India and in many African countries. Cashew tree bears numerous, edible, pear shaped false fruits or “accessory fruits'” called "cashew apples." Cashew nut measures about an inch in length, 1/2 inches in diameter, and kidney or bean shape, with smooth curvy pointed tip. Each nut splits into two equal halves as in legumes. Cashews featurec ream white color with the firm yet delicate texture and smooth surface. They are packed with soluble dietary fiber, vitamins, minerals and numerous health-promoting phyto-chemicals that help protect us from diseases and cancers. Great Source Of Essential minerals. Cashew nuts are rich in minerals such as manganese, potassium, copper, iron, magnesium, zinc, and selenium are concentrated in these nuts. A handful of cashew nuts a day in the diet would provide enough of these minerals and may help prevent deficiency diseases. Selenium is an important micronutrient, which functions as a co-factor for antioxidant enzymes such as Glutathione peroxidases, one of the most powerful antioxidants in the body. Copper is a cofactor for many vital enzymes, including cytochrome c-oxidase and superoxide dismutase (other minerals function as co-factors for this enzyme are manganese and zinc). Zinc is a co-factor for many enzymes that regulate growth and development, gonadal function, digestion, and DNA (nucleic acid) synthesis. Great Source Of Essential Vitamins. Cashews are also good in many essential vitamins such as pantothenic acid (vitamin B5), pyridoxine (vitamin B-6), riboflavin, and thiamin (vitamin B-1). 100 g nuts provide 0.147 mg or 32% of daily-recommended levels of pyridoxine. Pyridoxine reduces the risk of homocystinuria, and sideroblastic anemia. Niacin helps prevent "pellagra" or dermatitis. Additionally, these vitamins are essential for metabolism of protein, fat, and carbohydrates at the cellular level. Prevents Age-related Macular Degeneration (ARMD) in the Elderly. Cashew nuts contain small amount of zea-xanthin, an important pigment flavonoid antioxidant, which selectively absorbed into the retinal macula lutea in the eyes. It is thought to provide antioxidant and protective UV ray filtering functions and helps prevent age-related macular degeneration (ARMD) in the elderly. Study authors concluded, "Frequent nut consumption was associated with a reduced risk of weight gain (5 kg or more). These results support the recommendation of nut consumption as an important component of a cardio-protective diet and also allay fears of possible weight gain." Practical Tip: Don't let concerns about gaining weight prevent you from enjoying the delicious taste and many health benefits of cashew nuts! Cashew nut allergy is a common hypersensitivity condition in some individuals, especially in children. The reaction symptoms may range from simple skin itching (hives) to severe form of anaphylactic manifestations, including breathing difficulty, abdomen pain, vomiting, and diarrhea. The allergic manifestations are due to chemical compound anacardic acid (urushiol) that is present in cashew apples, shells, and nuts. Cross-reactions may also occur with some other nuts and fruits of Anacardiaceae family such as mango, pistachio, etc. Individuals with known allergic reactions to cashew nut and fruit may observe caution while eating them. 1. USDA National Nutrient Database. 2. Stanford School of Medicine Cancer information Page-Nutrition to Reduce Cancer Risk.